The AVPR1A gene is located on chromosome 12 and can be found around the kidney, liver, and vascular system. This gene is considered to be "well expressed." The gene's sequence has 52 variations, affecting tissues/regions such as the kidney (seen 10 times), brain (3), fetal brain (3), breast (2), liver (2), lung, PCR rescued clones (2), pancreas (2) and 14 more tissues. The protein is a receptor for arginine vasopressin. Vasopressin receptors are part of a group of protein receptors called G protein-coupled receptors. G-protein-coupled receptors make up a large group of receptors that sense the molecules around the cell and activate signals to other cells. There are three subtypes of the vasopressin receptor: V1A, V1B, and V2. The AVPR1A gene appropriately encodes for the V1A subtype. V1ARs are found in many places including: vascular smooth muscles (muscles in blood vessels), the brain, kidneys, testes, liver, and more. Vasopressin interacts with serotonin in the hypothalamus to control our communicative behavior. (The hypothalamus is the region of the brain that controls endocrine, autonomic, and behavioral functions). Because the AVPR1A gene mediates the effects of arginine vasopressin (AVP) in the brain, it is a major candidate gene for autism. AVP plays a critical role in maintaining homeostasis, such as regulating water retention and constricting blood vessels. Additionally, AVP is also directly released to the brain, suggesting that it plays an important role in social behavior. AVPR1A polymorphisms are also closely linked to social interaction and pair-bonding, one of the central determining components of autism spectrum disorder. Below is a video from the Autism Science Foundation describing some of the links between AVPR1A and autism. There have been several studies done to test the AVPR1A gene’s relation to musicality and dancing ability. AVPR1A is thought to contribute to the “dance phenotype,” which essentially translates into how well one can dance. One study compared athletes and dancers, and found that the dancers in general had significantly higher levels of arginine vasopressin. The association between AVPR1A polymorphisms and dancing is proven by the overrepresentation of polymorphic variants in dancers. The association between AVPR1A and dancing reflects the importance of social relations and communication in the form of dancing. Both dance and the AVPR1A gene are contributing factors to the creation of social interactions from the molecular level to the physical level. Playing and practicing music is in many ways a form of social communication, and is therefore related to functions in the brain controlling social skills. Scientists have analyzed the arginine vasopressin receptor 1A, along with other hormone receptors in the brain, and linked it to musical aptitude in humans. One group of scientists studied these social hormone receptors in 19 Finnish families, and found a haplotype association between the AVPR1A gene and high scores on a musical aptitude and creativity test that they administered among the participants. We performed a lab to try to amplify and isolate the AVPR1A gene in our own bodies, using specific primers and PCR. 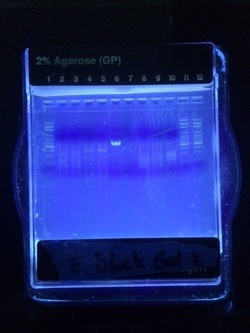 On the left is the resulting electrophoresis gel (columns 6 and 7). The PCR product length was supposed to be 604 base pairs. By the look of the picture to the left in comparison with our 100 bp ladder, the bright spot in column 6 is somewhere in between 600 and 700 base pairs - where it should be.